Over the years we have watched how worldly music has slowly but surely, crept its way into the church and has now set up camp amongst us, without us even realising it. What is sad, is that due to the lack of teaching and discipline, people can hardly tell the difference between a song of praise to God and a song of entertainment for man. I struggled with it myself at one point, however even without being able to differentiate between the two, I was still able to clearly identify that when certain songs come on it caused people to move in a particular type of way. Movement is important when it comes to music, I’ll explain why a bit later on in this post. If your friend was having a birthday party in a hall, what would you present to that friend? If I was to take worship out of the church and swap it with entertainment, there’s an issue. God’s requirement from us as His children is our worship and when we begin to give it to man it now becomes idolisation. 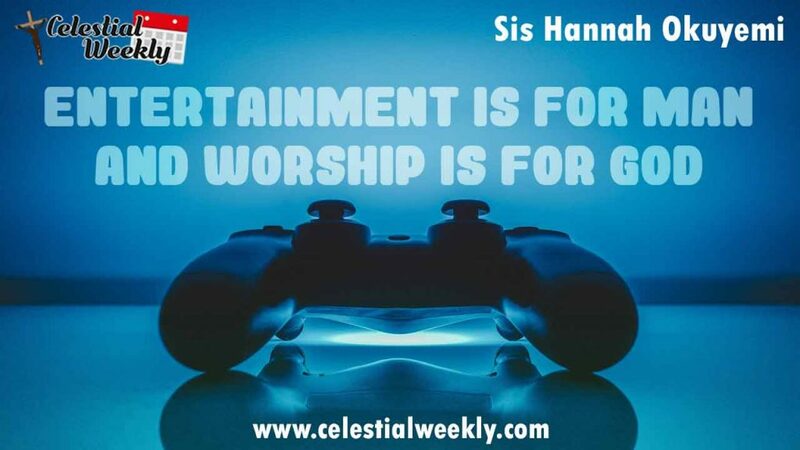 Likewise entertainment is never something you offer God, you will notice in the bible when there’s a requirement to worship there is an order that comes with it, because God being a holy God will not accept just anything being presented unto Him, hence why it was said that if you worship Him the requirement is that it’s done in “spirit and in truth”. From the above scriptures can you notice the trend? With worship, there is a way you must worship and restrictions to what and how you present yourselves towards God. The issue with music in a lot of our celestial churches, is we have swapped the hymns and spirit inspired songs we have been given by God with meaningless songs that do nothing but cripple and entertain God’s people. You notice how these days when you sing a song such as “gbeke re le Oluwa ninu ijo mimo yi” (Establish your faith in the Lord in this Celestial fold). The majority of the congregation are unresponsive until they hear “oruko to gba mi la” (the name that saved me) with some added drums, everyone begins to fly. Why? Because we have become so attached to those things that give us pleasure, than to the hymns and songs that bring us to repentance. In other words, we are so indisciplined that our hearts are no longer receptive to the things that will connect us to our God. Now let’s address the difference between a Celestial song and an ordinary song. Celestial songs/hymns are those that are given for the purpose of drawing your heart and attaching it to God. You notice how when you sing one of our hymns it always gives you direction? Our songs point you in the right direction so that you can work correctly as touching God’s will for your life, in order to bear fruits that are worthy to be presented back unto Him. Your harvest! That is why during harvest period our songs should be as a result of the testimony that we have received having sown a seed at the appointed time. What is your testimony? What have you received from God? What is the condition of your harvest? How is your investment looking? Our songs during harvest remind us of judgement day. Soon a day will come in which we will give account. Now my question is to you, how much of that is displayed during your harvest? What are you reminded of with songs? There is a purpose for every event in celestial that our songs capture its very essence. It needs to have a purpose and bring your attention to something. That is the difference between a Celestial song and one that has no depth or purpose. Now let’s address the dance? Do you notice how you can never “shaku shaku” to a hymn? Why is that? I said before, every Celestial song has a purpose, if the purpose of the song is telling you to take care of your works and God is watching, shaku shaku is the last thing on your mind right? However, you notice it’s when those meaningless songs come on that its soul purpose is to entertain you, you will now begin to komole (dance to the ground). In such a way that brings peoples eyes off God and they now begin to attend to you. Dance is an interesting one because most youths don’t see anything wrong with certain moves in church. It’s very simple, the same thing you use to praise yourself at a party is not what you give unto God. If we were to truly check ourselves most of these moves were derived from self-edification purposes. They are designed to make you look good. On its own, there’s nothing wrong with them, but when you begin to give what is man’s to God, that’s the issue. That is why when Jesus was challenged about tax, He made it clear, what is man’s belongs to man but what is God’s belongs to God. They cannot be interchanged. Let us begin to take more care with what we offer God. May God help us all. Amen. So so true. I just love this piece. God help us. We are too easily interested in fleshly things. We naturally go against way of God that is why our worship is important and a constant conscious decision to worship truly and not become distracted. All this gbamu gbamu musical style that we have allowed into the church and worldly styles of dance has seriously made us lose focus.